In continuing the tradition of the Taber Foodgrains Project, this year’s harvest went down in late August in front of 200 local spectators. As part of the Canadian Foodgrains Bank, which has been around since 1983, the Taber faction of the group has been going strong since 1997 and this year they had a 150-acre field, located east of Taber, near Purple Springs. This year’s crop was wheat and averaged 105 bushels per acre, which according to the group was above normal compared to past years. “This year’s crop was definitely above average. We’ve been blessed with good yields in the past, but this year was exceptional,” said Jeremy Wind, chairperson of the Taber and District Foodgrain’s Project. 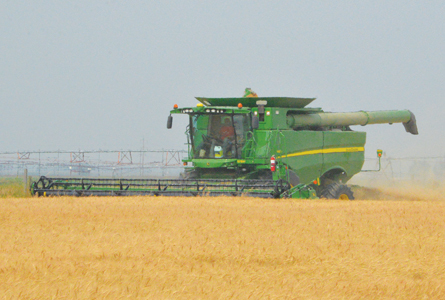 In order to get the harvest underway, 11 combines, four-grain carts and 10 trucks were on hand to get the job done. The estimated gross for this year’s crop was also set at approximately $115,000, which the crop then goes to countries in need of food. Even with floods causing havoc across southern Alberta, the Taber portion of the foodgrains project was able to get their crop in the ground earlier than in 2017. Harvest, on the other hand, did see a minor delay that caused it to be behind a few days after everything had worked out. “This year’s crop was seeded about a month earlier than last year because of a cool spring and flooding, but harvest was only two days later than last year,” added Wind. The event also heavily relies on the support of the local community who continues to show more and more involvement each year. Wind says the harvest continues to see rising numbers each year and they expect that to continue moving forward in the future. “The community support for the project continues to get stronger each year. We have a longer list of volunteers, more donations and more people who come out for the barbecue each year,” continued Wind. Even with the 2018 harvest wrapped up, the team at the Taber Foodgrains Project continue to put in work getting ready for next year. As with every year, one of the biggest challenges they face is finding a good chunk of land big enought that would be suitable for their needs. On top of that, they are always assessing the project and looking for new ways to make it even better moving forward. “We start planning for next year right away, starting with securing land to rent for next year’s project as well as coming up with ideas to improve awareness and participation,” said Wind. If you are interested in helping out with the 2019 Taber Foodgrains Project or want to donate land towards the harvest, check out the Taber Foodgrains Project Facebook page at http://www.facebook.com/cdnfoodgrainstaberproject.